Abstract: If "form defines function", our usual assumption may be that a "perfect form" is needed to allow "perfect functioning" of a device, where the function may relate to precision sensing, or the storing or transmission of information. However, there has been much recent excitement associated with defects in crystalline semiconductors such as diamond and SiC. These defects combine optical emission at a variety of wavelengths, distinctively coupled to long spin coherence times. Thus, such defects can provide a wealth of new opportunities for compact, integrable photonic sources as well as serve as promising candidates for quantum information applications. This talk will focus on our use of nanobeam photonic crystal cavities, fabricated from 4H-SiC, and which achieved an 80-fold optical enhancement of a "Si-vacancy, V1" transition with emission at about 860 nanometers. The high quality factors of our cavities (Q ~5000) allowed separate, tuned resonant enhancement of a related V1' transition which differ from V1 by only 3 nanometers in wavelength. The combination of high quality optical cavities, tuned to the breadth of defects and hence optical transitions in SiC, can not only produce precision, tuned optical enhancement, but also serve as an exceptional means of studying the defect formation and migration, as well as details of their local atomic environment. Biography: Evelyn Hu is the Tarr-Coyne Professor of Applied Physics and Electrical Engineering at the John A. Paulson School of Engineering and Applied Sciences at Harvard. Prior to Harvard, she was a faculty member at UCSB, in the Departments of Materials, and of Electrical and Computer Engineering. 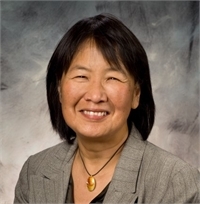 While at UCSB, she also served as the founding Scientific co-Director of the California NanoSystems Institute, a joint initiative between UCSB and UCLA. Before joining UCSB, she worked at Bell Labs in both Holmdel and Murray Hill. She is a member of the National Academy of Sciences, the National Academy of Engineering, the American Academy of Arts and Sciences, and the Academica Sinica of Taiwan. She is a recipient of an NSF Distinguished Teaching Fellow award, an AAAS Lifetime Mentor Award, and holds honorary Doctorates from the University of Glasgow, Heriot-Watt University, Hong Kong University of Science and Technology, and the University of Notre Dame.